Summary: Wanna make a special bracelet for autumn? Today we'll show you how to make a very pretty agate beads cluster bracelet, its fresh color is perfect for autumn days. You only need 3 kind of materials in order to make this beautiful agate beaded bracelet. Easy to make and with great impact, you can wear it with a casual outfit. I choose some agate in different shades of red but you can change the beads and their color as you consider it fit for your project. Step 2. 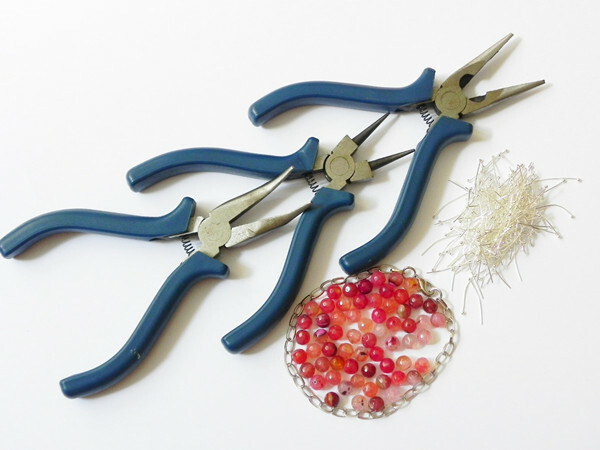 Place the round nose pliers at the top of the headpin and bend the headpin up and over the round nose pliers until it meets the agate bead and you have a nice round loop. Repeat this step for all 70 beads. Step 2. Put 2 of the agate beads on each side of the link and than close it. Step 3. Take the next link of the bracelet, open it and put an other agate bead, than add the previous link that already has the 2 agate beads, just as in the picture below. Step 5. Repeat the steps above with all the links of the bracelet. 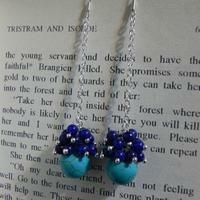 Each link has to have 2 agate beads. After all these simple steps, you have a nice, colorful agate bracelet.